It’s the age old question isn’t it: flat pedals, or clip-in pedals? It used to be pretty simple. If you were into downhill riding and dirt jumping, you rode flats. If you were into XC or any other kind of everyday trail riding, you rode clips. 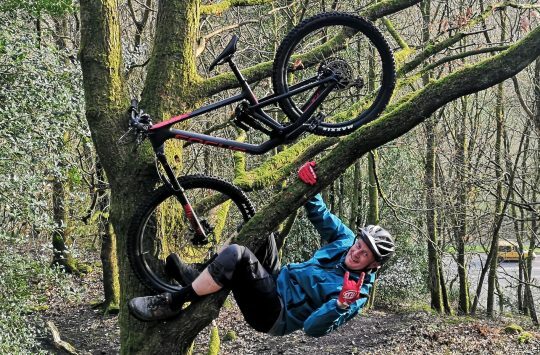 That may still be the case for many riders, but as with many aspects of mountain bikes these days, the lines are getting blurrier and blurrier. So we’re interested to hear what you’re using for most of the time. Do you normally use flat pedals? Or do you prefer to clip-in? You can vote in the poll just below, and if you have a spare moment to comment, we’d love to hear what pedal and shoe setup you’re running! What do you use most: flats or clip-in pedals? 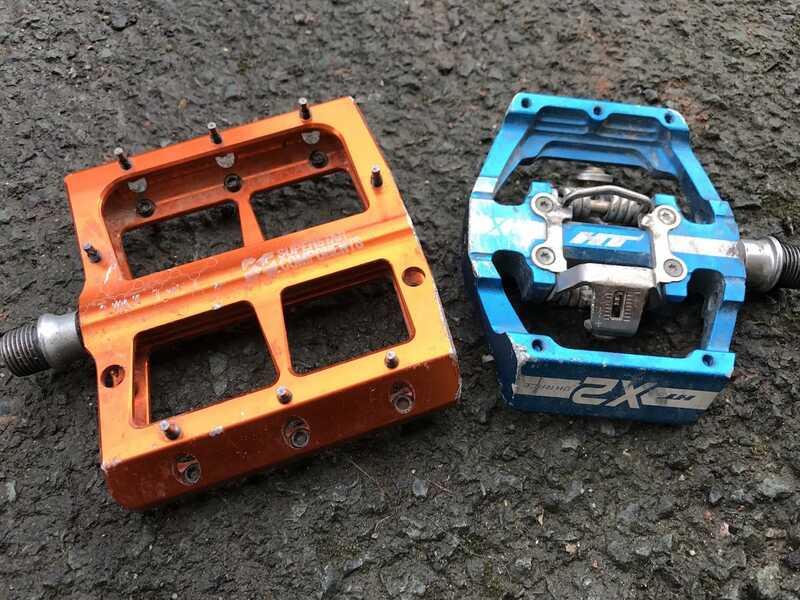 First introduced to the off-road world in 1990 by Shimano, clip-in pedals (formerly and incorrectly labelled as ‘clipless’ pedals [Wil is willing to take this assertion to the pub – Ed]) promptly rose amongst the pro ranks in mountain bike racing. Offering more efficiency and better power transfer by way of stiffer clip-specific shoe soles, for many competitive types there is no other choice. 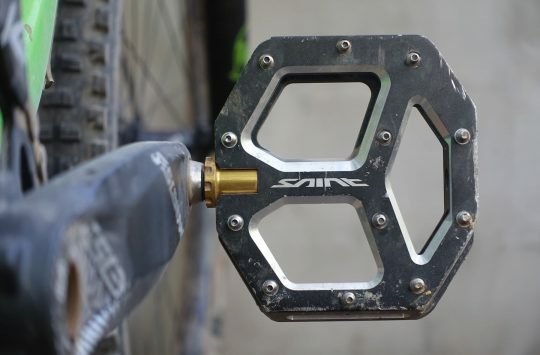 Fast forward a couple of decades, and there’s now a load of World Cup downhill racers using clip-in pedals, and (aside from a one Mr Sam Hill) most of the EWS field chooses to clip into their pedals too. That said, there are many different varieties of clip-in pedals these days in addition to the XC racing ‘lollypop’ SPD pedals. For those who prefer baggy shorts and big travel over Lycra and lockouts, there’s a growing crop of platform-style pedals that emulate the larger size of a flat – pins and all – but with a clip mechanism at the centre of the pedal. A clip-in mechanism is designed to keep your feet locked to the pedal. 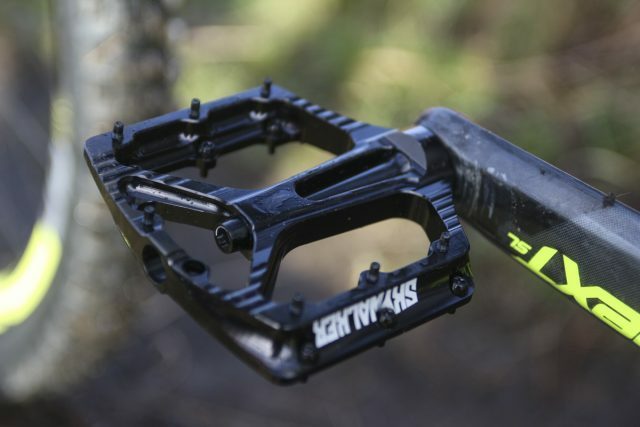 For the upcoming issue of Singletrack Magazine, we’ve been testing eight of these new-school platform clip-in pedals, including options from Crank Brothers, HT Components, DMR and Shimano. Each one uses a clip mechanism that locks onto a cleat that bolts onto your shoe – the idea being that when you’re clipped in, your foot is located in the same position every time, so you can optimise your saddle height to provide the most efficient position possible. And for riding rough terrain, the clip helps you to stay stuck to the bike. Compared to the smaller racing pedals though, the big platforms on these pedals are designed to provide more support when used with more flexible footwear. And with the addition of textured bodies and adjustable pins, the platform is supposed to increase traction between shoe and pedal. The bigger platform is designed to be used with a softer rubber sole for more traction and stability underfoot. 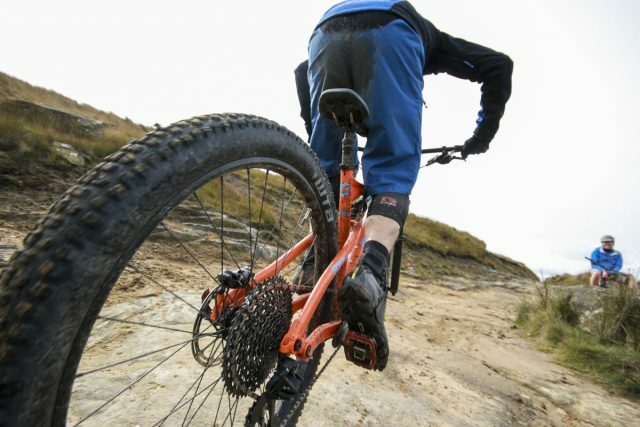 Despite the general trend for racer types to use clip-in pedals, we’re noticing that more and more everyday trail riders are trying out flat pedals – perhaps after years of using the clip-in variety. Flat pedal users cite the added flexibility as the main advantage of using flats, plus you can easily pop a foot off in the turns if you’ve pushed your talent too far. In theory, flats should also teach better technique – you can’t bunnyhop just by tugging your feet on the pedals to lift the whole bike upwards. 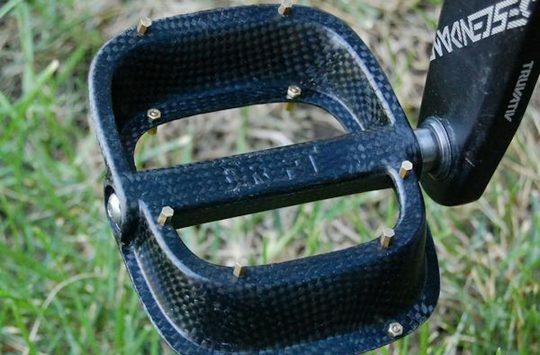 Last year, David Hayward put together a brilliant introductory piece to flat pedals for those interested in those benefits. He also tested no fewer than 17 flat pedals to find out which were the grippiest, the toughest and the best value. James loves a bit of foot-out action. Flat pedals have won medals, but are they better for just everyday trail riding? So, what pedals do you use most of the time? Are you a flat pedaller? Or are you a clipper-innerer? Or maybe you run one setup on one bike, and a different setup on another bike? We’d love to hear your thoughts, so tell us what you’re rolling with in the comments section below! Exclusive! Sonder Has A New 29er Full Suspension Prototype And It's Hella Fresh! Flats on the DH bike, enduro, xc and cross bike, clips on the road bike and that’s only because you look daft in fivetens and lycra. Oh and clips on the turbo for fast spinning. I run Time ATAC pedals on both hardtail and FS bikes, as I have for many years. I find they clear well in my local Cotswold mud. I wear stiff shoes with these: Sidi Dominators & Northwave GTX for winter. Flats. After 25yrs of mtb , mountain biking at grOundle level has change, more travel more expectation of jumps drop offs etc. Spd s might be more efficient but for mere mortals just work on your fitness. 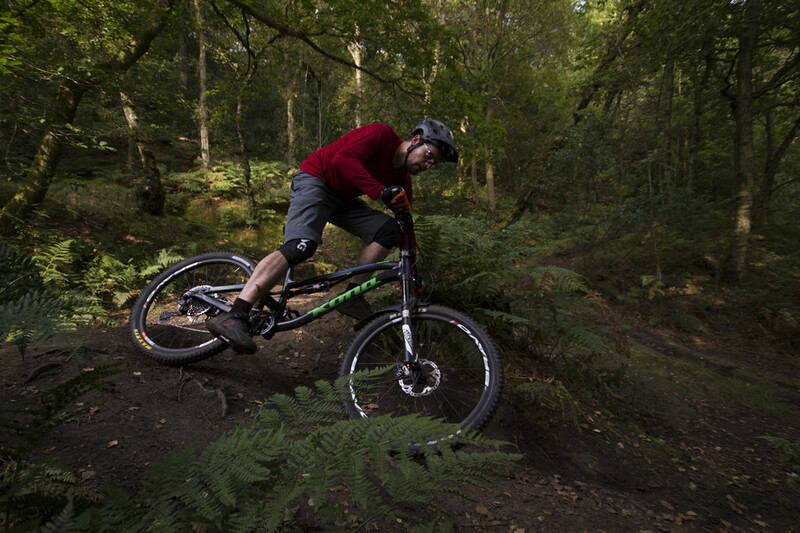 Flats just like dropper posts give you confidence to try stuff knowing you can bail from the bike with ease. Plus if you manage to bunny hop, get air etc on flats you know you are doing it right. And when you have to walk or just want to get off the bike and explore you are not waddling around like a duck. Flats as that’s what I’ve always run. Even use them on the road bike/commuter. Everyone tells me to go clipless but I like the fact that I can dismount nice and easily. Having seen various failed dismounts from people trying clipless for the first time I’m not bothered. Some people say clipless are x percent more efficient and it’s easier to bunnyhop but I’m not getting left behind and can bunyhop, in a limited sense, with flats so I’m ok thanks. I’ve only ever used flats so can’t comment on a comparison. I haven’t seen a compelling enough reason to spend more on new shoes and pedals. Run Time ATAC on All my bikes (Road, Pub, FS and Hardtail), Stiff Carbon Sole on Road, Bont. Rythem on FS and HT, NW Missions on Pub. I ride both… wheres the option for that? After quite a long spell riding with Shimano clipless, I’m giving Crank Bros pedals another try. Obviously for the added ‘float’ and not for the fact that they come in colours that closely match my bikes. I’ve got flat pedals on my pub bike and the tandem, but feel like a clown when riding them as I’m constantly lifting my feet off the platforms. Think it’s too late for me now, save yourselves. For obvious reasons, I’m doing all my riding in winter boots at the moment. I treated myself to a pair of Shimano MW7 boots. Nice and comfy, stiff soled, but not impressed with the new design. I used to be able to get away with the odd ‘dab in a stream’ with my old MW80’s, but the new ones have a lycra tongue hidden under a flap which quickly lets water in when they’re submerged, as opposed to the older design with a waterproof leather tongue. Summer riding is done in a pair of Lake SPD boots. Both. Come on give us proper options. Chipps, do you run SPD’s then? I run Clips on the road, and have both options for the MTB, recently gone back to flats as my shoes set up for my candy’s gave up the ghost and my only other option for now are a pair of old squash shoes! My first mountain bike (1988 Raleigh Dune dancer) came with toe clips which caused me all sorts of problems after being used to flat BMX pedals. Never felt the need to try and clip in since. went to flats about 5-6 years ago after 20+ years in clips. mtb’ing for me changed from serious to fun and switching to flats followed suit. coffeeaddikt – I just realised I mistyped that I’ve always run flats, when I’ve always run clip-in pedals. Sorry about that! Fixed now. All of the above. SPD SL pedals on the road bike. XT trail SPDs and Shimano shoes on the short travel FS Bike which tends to get used for mile munching rather than very tech rides. DMR Vault flats for the big bike and DH riding. I like the efficiency of being clipped in but think I descend better on flats which I much prefer for more technical trails. I believe that’s down to foot and heel position which try as I might I can’t seem to quite reproduce on SPDs. I used to be a Crankbrothers fan but got fed up with their pedals falling apart. Time pedals, Z Strong’s, nice & wide for my MTB’s. Unfortunately they don’t make them anymore! I can use SPDs comfortably, did for the first time on a road bike for a week on holiday, took to them quickly and didn’t fall off sideways once when stopping. Off road though I just want to throw a foot out or down every so often, so flats all the way for MTB. As an old roadie, I can’t conceive of riding flat pedals. It feels so wrong not being connected to the bike. I have SPDs on the full suss and flats on the hardtail, but I ride the susser more frequently so answered clips. I use flats on my road bike as well as my MTB thanks to having dodgy knees in the past, which used to benefit from my moving my feet around on the pedals slightly when I felt ‘tension’ behind my knee caps. I think I’m nervous about upsetting them again by trying clipless. ONZA HO Titanium clip-less (pukka vintage) with Shimano shoes ((and clip-less because they came after toe-clips!!)) On a Marin hardtail plus. Just voted – flats obviously – poll is just like Brexit at the minute, 52 to 48 % ! If flats ‘win’ does that mean the clip users will be forced to change ? tried every type of clip-in and went flat – never looked back and will never go back. ride fivetens and vaudes with hope f20’s and my favourite crank bros stamps small size. the crank bros never score well in magazine tests (tho usually its the large that get tested) but i’ve found them to be better than the rest. f20’s also robust tho not so grippy but they’re way too expensive to put in the spares bucket. However if flats lose the vote and the pedal police come to confiscate them, i’ll give up the hopes and hide the crank bros in the attic. Was SPD but since I started coaching 4years ago switched to flats and never looked back. DMR V8 fit my feet perfectly but I also run Nukeproof plastics with Shimano AM something or other. Flats for everything here too, even on the road bike. I used to get lots of people telling me to “upgrade” my MTB to clipless, but that doesn’t happen now. Happens on the road bike all the time though! I’ve run SPD’s for almost all of time …until I had a knee injury. I have found to my cost that badly set up SPD’s can really knacker your knee! I’ve now been on flats for a year (maybe I need a self help group) and although getting use to them I do miss the ultimate control and 360 power transfer that SPD’s bring. This year I shall be leaving my flats on the FSB but going back to SPD’s on the hardtail and cyclecross bikes. Frodo – look after your knees friend cos you’ll miss them when they’re gone. For 360 power stick with flats and focus on lifting your trailing leg on each pedal stroke. I think Ned Overend mtb legend may have come up with that. flats all the way for me. I’ve tried clipped in and just cannot get used to it, I like the freedom of being able to move around that flats give. Clips – been riding SPDs on everything for 20 years. Closest I have to flats is a set of Vtwins on the FS bike paired with Terraduros. Flats. 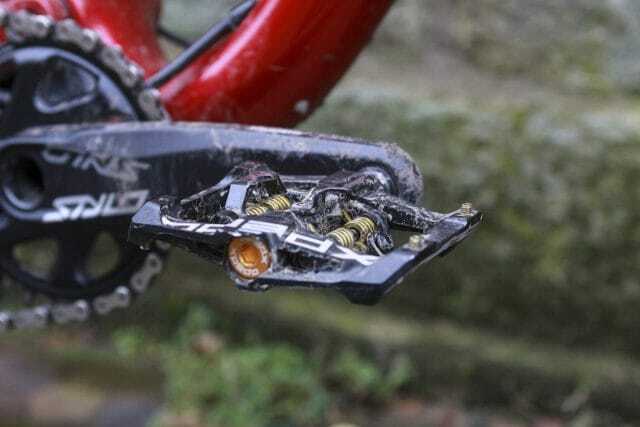 When I became a mid life crisis mountain biker I read that clips were far superior and it was worth the few comedy moments when you bounced off the tarmac because you couldn’t get your feet out of the clips sin time. I decided my bones were too old for that kind of comedy and so went flats, mostly wellgo or superstar, and inov8 roclite boots whcih are excellent both riding and pushing. clip in on all bikes always Time’s. my original atac xc pedals still going strong after 20yrs. no servicing, original bearings and british winters. Clips on my rigid singlespeed, flats on my 160mm F/S and 160mm hardtail. nxgater: Yes, it’s important to look after one’s knees. Perfect set up with clipless pedals seems crucial for avoiding problems in such an important part of the body, presumably lots of people manage that though. Well TimothyD you’re right and for road riding where you basically hold a position for most of the time I can see how that works. For mtb where you’re changing position all the time I just have concluded that flats are better for riding and better for your knees. Flats for fun, on my jump bike and trail bike; clipless for distance, on my road bike, commuter bike and occasionally on my trail bike. All based on need for efficiency vs need to bail! For regular and technical trail riding, I use Shimano XT clipless and Specialized Comp Mountain Bike shoes. For DH, I use Deity flat pedals and 5.10 Sam Hill Mountain Bike flats. I’ve ridden clipless for so long, I can unclip fairly naturally now, so unexpected dismounts are a non-issue. I seem to be able to bail just as fast as with flats while DH riding.